Properties in Baddeleys Beach average 4.6 out of 5 stars. Property 6: Ruru Lodge, Kotare House. Spacious, modern, light, convenient, fully fitted. 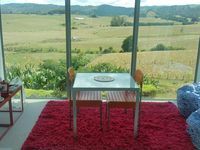 Property 16: Matakana peaceful rustic retreat. Property 17: Joie de Vivre. Stunning and unique. 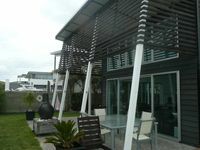 Property 46: Matakana Village Bungalow The best available. Property 50: Kawau Kabin, 3 bedroomed house, South Cove, Kawau.